This is another very hardy plant. Eremophila maculata (Spotted Emu Bush) occurs in a number of colours and habits, from a shrub to two and half metres by about the same wide, to a sprawling plant about half a metre tall by about 2 metres across. The plant in the photo is a dark pink form to 2 metres high and across here. It has large tubular flowers with spots inside the throat of the tube. The Honeyeaters absolutely love this shrub. They have been very busy nesting and arguing over territory and there seems to be a lot of different species around this year. The eremophilas are providing a wonderful food source at the moment. 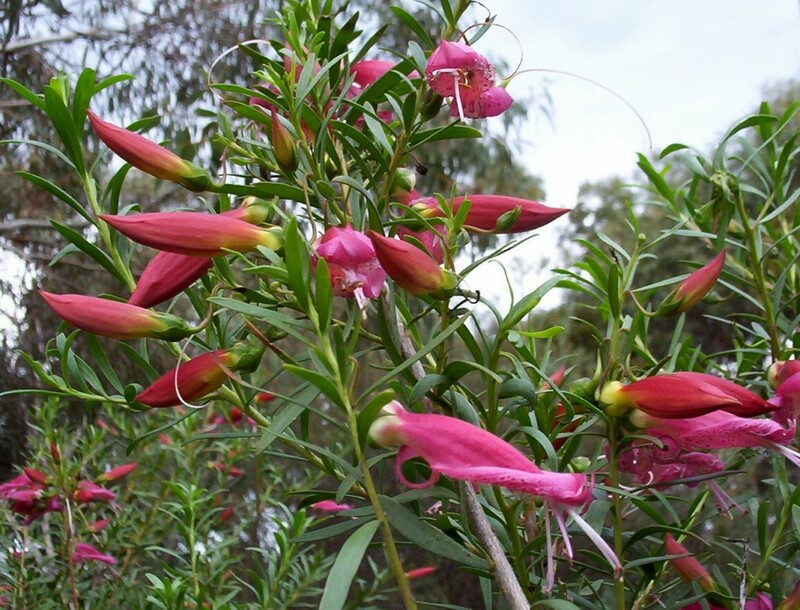 This eremophila is one that grows best in heavier soil that is well drained. It is a very hardy plant. They don’t mind dappled shade for part of the day or the root competition from the nearby mallee trees. Soil with a very high pH like we have here is no bother either. Eremophila maculata makes a great screening or hedge plant. It responds to very hard pruning by sending out many sprouts from the cut site. These are very hardy. Make sure it gets adequate sun, water it regularly for a few weeks to get the roots from the root ball into the surrounding soil. Tip prune ie. pinch off the top 2 cm of growth on each branch to keep the bush compact, otherwise they can grow into a woody and straggly plant.